How many projects can you work on at one time? Every once in a while I like to take stock of the things in my sewing studio. I go through my fabric bins, rifle through my patterns, pull out any half-finished projects and stack them up. For me, I count a project as being “in the works” if I have both the fabric and the pattern to make it, whether or not I’ve started or cut out the project. Sometimes I’ll have an entire project cut and ready to be sewn, other times I’ll have made the pattern and selected the fashion fabric, but not yet tested the pattern out of muslin. Other times I have a great idea for a particular piece of fabric, but I haven’t made time for constructing the pattern yet. As I’ve said in past posts, I’m not someone who buys a few yards of something with the intent to think of how I’ll use it later on. If I buy it, I have plans for it. Yes, those plans may change, but it all has a purpose. The problem is, I’m finding more and more often that I’m creatively weighed down by the amount of possibilities that I have. I’m not whining about “having too many choices”, I promise. I’m trying to explain that with more and more options to choose from, I waste time thinking of what to work on next, instead of grabbing a project and going with it. I spend a part of each day in front of my see-thru bins of fabric thinking about what each piece is meant to be. 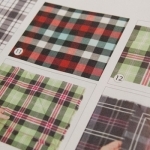 I’ll dig through my yardage, pull a couple of options out, and then ultimately question if I’m choosing the right pattern for each piece of fabric. It leads to me feeling frustrated and eventually putting everything away and going back to working on the computer or abandoning my studio entirely. Nothing gets sewn, and my creativity takes a nose dive because I’m not actively making anything. I’m procrastinating making choices because I’m afraid. I have a fear of sewing something and then not liking it. I’m not sure where it comes from, because I feel like it’s not even based on anything. I’m lucky in that I don’t have many project failures. However, I don’t have a gigantic fabric stash, so each piece feels very precious to me. The perfectionist part of my brain says every garment has to be absolutely meticulously executed. What if I screw it up? What if the fit isn’t just right and I never wear it? What if? What if? I don’t want to waste the yardage I have. It’s exhausting. It kills my desire to draw and cut and sew. I’ve had enough of it. I made a list of all of my projects and have slowly started to make my way through it. A few of the items on the list were related to future side projects that I can’t share yet, but others have been gifts and one was just for me. It was Grainline Studio’s Hemlock Tee. I absolutely love it. Did I fret about cutting up the tissue knit I used for the shirt? Yep. Of course. It sat on my table for a good week and half while I debated if it was exactly what I wanted to use it for. Am I happy that I told myself to get over it and just cut it out? YES. It felt so good to sew it up, and I love the result. I need more of that. These are the items that I’ve chosen to work on first to cut, sew and finish. This is going to be great! 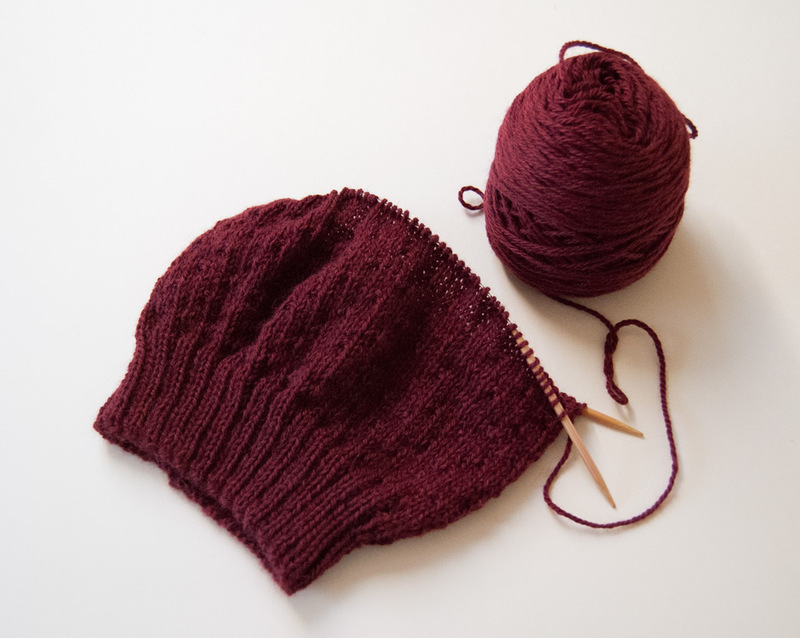 The Jul Hat by Wiksten has been knitting up very quickly in a maroon baby alpaca yarn. It feels like heaven and I like to work on it in the evenings while curled up on the couch under a big blanket. I can’t wait to finish it. Knitting is a no-pressure activity for me because I can always frog what I don’t like! I’ve saved this sweater knit for the longest time to make a shawl-collar sweater dress out of it, but I don’t know when I’ll ever have the time to make the pattern for the dress in my head. 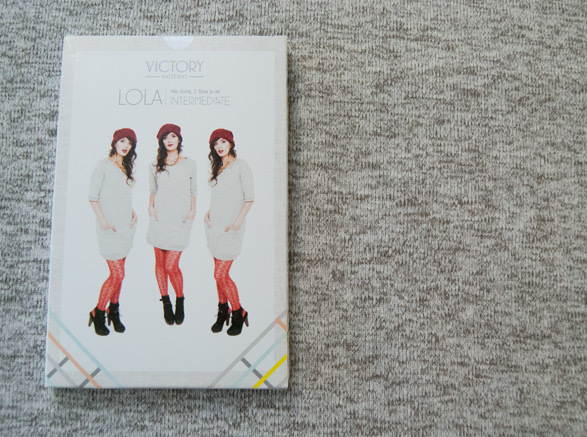 Instead I’m using the Lola from Victory Patterns because it is going to feel like heaven. Those 3/4 length sleeves and deep pockets are going to make me very happy! I bought this deep blue sweater knit from Bolt last winter, and I kept telling myself I’d make up a great knit cardigan pattern for it. Has it happened? Obviously not. 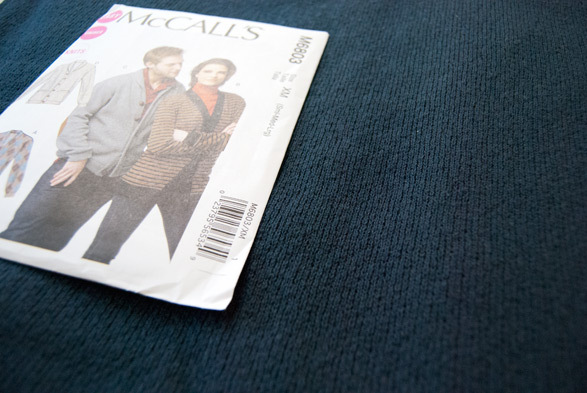 I picked up this McCalls M 6803 the other day so I can spend my time sewing instead of perfecting patterns. I don’t always trust Big 4 patterns, so this one will get a careful screening before I cut into my fabric. What does your list of projects look like? Are you good at finishing what you start, or do you need a little push from time to time? This entry was posted in Knitting, Projects and tagged fabric, knitting, patterns, quilting, sewing on October 25, 2013 by Amy Alan. My handy husband is building me a cutting table with storage for Christmas! I’m super excited! Meanwhile, my craft room is in disarray so I am sure once my craft room is finished and I organize it, I will find all kinds of unfinished projects. I decided not to work on anything, new or old, until I organize but I cheated by working on cross stitching. I haven’t done it in years. There were several that were only missing French knots, so I taught myself to do them and finished. 2 are missing the right color floss, but I do have the DCM numbers so hopefully I can match it and finish. The other I had stopped when I miscounted and got frustrated but when I took it back out, I realized I could work around it. I’m happy that you like your projects once you’re done with them. I don’t understand why we question our choices so much though. Is it a creative brain thing? I really want to be able to jump into a project and not question myself and my initial ideas so much! I would be in SO MUCH TROUBLE if I bought all of the fabric that I adored without a plan for it. You’d find me buried under a pile of silk and wool that was ten feet deep. I can’t imagine what’s keeping you from sewing, except that little cutie who follows you around. 😉 Now HE would have fun in your fabric stash! Haha, yeah he’s already had fun in it, when I was trying to get more space in the closet to store his clothes that are too small. Hi, Jennifer! Can I ask how you’re working on it? Any ideas would be greatly appreciated! It’s hard to pick something and just go for it. Do you think it’s a problem that most people with creative brains have? Oh my gosh, your procrastinating explanation fits me to a tee! I’m often finding myself just staring at the possibilities, afraid to plunge in and get creative! I wonder if a good purge of my fabrics would help, but sigh, which ones? I did a big purge of my fabrics last fall, with a stash-busting challenge. It felt really good to donate fabrics that I’ve held on to for years and never used to a local non-profit store that sells craft/knitting/sewing supplies. I can’t even remember what all I donated now, which is a good sign that I didn’t need to hold on to them. I say you go thru your fabrics, and anything that you forgot you even had, you donate. It’s obviously not that important if it’s sat unloved in the bottom of a bin for years. Then make a plan for every other piece, and stick to it. It’s felt wonderful to start to work my way thru my fabric stash! My fabric out of site is out of mind, put some away, and later go oooooh forgot about that. Left projects get better like marinade. That’s interesting that you say the projects “get better” for you. Do you mean that you find them more interesting or that you have better ideas of what to make with your fabric once you go back thru your stash and find different pieces you’ve been working on? Thanks for this great post. I totally share every single bit of it. On the other hand, let’s admit that it feels so good to just dive into fabrics and patterns and day-dream about the infinite possibilities that could come out of it… What brings me back to reality is when I have to make something for a particular occasion. Then I get to my sewing table and just sew. The result is generally very rewarding. Finally, all the thinking and dreaming is maybe part of the creative process. I agree that a lot of the time digging through a fabric stash and coming up with different ideas can be great for your creativity. You may end up using a particular fabric for something other than your original idea, and like the new idea even more that what you originally dreamt up. Why does it a take a special occasion for you dive into your projects, especially when it feels so rewarding to finish something? I know that I’ve done the exact same thing, and afterwards wondered why I waited to make something that I get to enjoy wearing or using. What is it about looking thru all of your fabrics that makes you hesitant to jump on a project? I’d really love to know! I absolutely understand what you mean! A lot of my stash is made up of sort of expensive garment fabrics. Some of the yardage is from trips that I’ve taken, so there’s no chance of me being able to go back to a particular store and buy more if I mess up. I did have a thought while rummaging thru my fabrics though, which may help you. Whenever you go to a fabric store, can you always find something else that you like? There will always be more fabric. 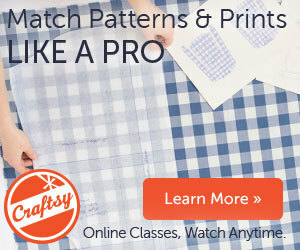 You will see new prints and weaves and beautiful patterns that you want to make. Even if a particular garment doesn’t turn out exactly the way that you pictured, it could be that one day a project exceeds your expectations. Charging ahead and making it is the only way to know how it will turn out. Don’t defeat yourself before you’ve even started! I always love projects that I return to, I seem to appreciate the work that has gone in to it , like admiring someone elses work somehow. Oh yes, okay- I understand! I do that too. But sometimes I have to laugh at myself when I see that the only thing that needs to be done is something very simple, like a hem or buttonholes. It’s amazing what I’ll put off doing until I have to! I love that you are talking about this! I have been having this dilemma for the last couple of months now (maybe longer). I thought I must have a sickness or something. I have a ton of different projects to sew, quilt, or knit, and they are all sitting around causing clutter in my office/craft room. I go through it in my head just like you talked about and maybe pull things out to look. Then I get extremely overwhelmed, and nothing gets done. I think the worse part for me is that I keep buying stuff. I see a cute remnant or pattern, yarn, etc. at the store or online and before I know it, it is in my craft room staring at me. I have been thinking about making a spreadsheet and seeing if that helps. If you can give anymore advice, please share. We are not alone, Julie! It sounds like you and I (and many other people) all suffer from the same craft-overload. I think that it does help to get out everything and make a list to see what you have to work on. Sometimes the shock of the list is enough to make you stop buying more fabric and patterns! I will work on writing up a few more tips for finishing and not feeling overwhelmed, because I think it’s something every creative person goes thru every now and again. Thanks for joining in on the conversation! I’m glad you found it helpful! Yes, fabric stashes can be lovely sometimes, and completely overwhelming at a certain point. At first it was hard for me to get rid of extra fabric, but now it feels so good to let go of fabric I’ve held on to for ages and never used. I finally have only my favorite things in my stash, and it’s great to use them and actually get to wear them! I hope your purging is successful! Yep, I’m here! 😉 We just moved to SE, so Mill End is even closer than Bolt now. That’s daaaangerous for me!